When the term ‘survival knife’ is seen or heard, many of us automatically get a picture of Rambo flashing through our mind. Yes, that is indeed is a survival knife that he wields in the movie. And no, that is no prop specially fabricated for the film. Survival knives of this size and deadly appearance do indeed exist. As indelible as this image may be to some of us, though, it’s well worth noting that survival knives come in a wide variety of styles, materials, construction, and overall composition. In a more sedentary, less violent world in which most people live, survival knives are used in many practical applications out in the wild. Killing wild game notwithstanding, survivalists have used the knife for everything from making firewood (often ‘batoning’, the act of placing the knife against the wood they want to cut, and pounding on it with another piece of wood), to assistance in cooking (placing a pot handle over the handle, or into a notch in the blade, holding it over an open fire), to hammering tent stakes with the pommel, among many other tasks. Much like hunting knives, survival knives come in fixed blade and folding blade models, each type having their own supporters and detractors. Fixed blade fans maintain this model is much more durable, easier to clean, with no worries about the knife accidentally closing up, cutting hands or fingers. People that prefer folding blades appreciate its smaller size when folded, with no worries about its durability. Another feature that users consider is tang length. Does the tang extend all the way through the knife, with the handle affixed around the tang? Or does it end at the handle? Some survival knives are accessorized with items around or in the handle, resulting in the tang ending at the handle. ‘True’ survivalists shun models of this type, questioning the strength of this knife, believing essentially that a knife should be a knife, and nothing else. Others like the extra features some provide. What steel is used in the knife is also an important consideration. Does the knife owner want carbon steel or stainless steel? Carbon steel can rust, so care must be taken here. But it is easier to sharpen than stainless steel, and is known for its near indestructability. Other variables people look for in knives include: blade length; blade thickness; blade finish; grind; style; edge; handle composition; sheath; and other factors. 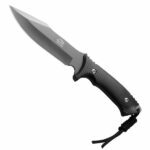 CRKT M21 Aluminum Folder– Open overall: 7.25″; Closed: 4.25″; weight: 3.2 oz. ; Blade length: 3.0″; Blade thickness: 0.12″; Finish: non-reflective frost (offers superior edge retention); Style: deep-bellied spear point; Edge: plain; Handle: aluminum; Features- flipper; one-hand opening and closing. CRKT Ultima– Open overall: 10.039″; Blade length: 4.95″; Blade thickness: 0.18″; Finish: Black Titanium Nitride; Grind: hollow; Style: Modified Tanto; Edge: Veff Serrations; Handle: Injection-molded glass filled nylon; Sheath: tactical. Buck Hoodlum– Open overall: 15.5″; Blade length: 10.0″; weight: 14.6 oz. ; Blade: Powder coated 5160 alloy; Handle: Linen Micarta, black; Sheath: nylon; Notes: handle is built with shock mitigation system (alleviates shock and wasted energy); groove cut into spine, aiding in small project tasks; handle can be removed, creating a spear. 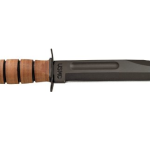 Gerber LMF II Infantry– Overall length: 10.59″; Blade length: 4.84″; weight: 11.67 oz. 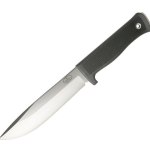 ; Blade style: drop point; Blade: 420HC Stainless; Blade type: serrated; Handle: glass-filled nylon with TPV overmold; Sheath: Ballistic nylon with fire retardant coating. Army & Air Force Issue Survival Knife– Overall length: 9.5″; Blade length: 5.0″; Blade: 1095 Carbon steel; Blade finish: rust-resistant zinc phosphate; Handle: grooved leather; Sheath: leather with integral belt loop and tie down holes; pouch for sharpening stone (included); Note- for sale in U.S. only (no exports). 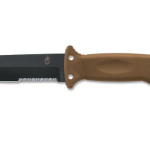 Gerber’s Bear Grylls Ultimate Fine Edge Knife– Overall length: 10.00″; Blade length: 4.8″; weight: 11.2 oz. ; Blade: high Carbon, stainless steel; Handle: texturized rubber; Sheath: nylon; Notes: features fire starter (Ferrocerium rod locks into sheath; striker notch incorporated into back of knife blade); diamond sharpener integrated into sheath; emergency whistle integrated into lanyard cord. 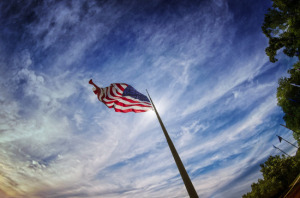 As with any outdoor product, it is highly recommended that consumers research all available products thoroughly before ultimately making a product purchase.